The flag of South Carolina is in a league of its own, but not solely for its looks. What earned it the number one spot on my list of state flags was its combination of a clean and classic design with imagery linked to a very important event in South Carolina and American history, something no other state flag does. In 1775, Col. William Moultrie was asked by the Revolutionary Council of Safety to design a flag to be used by South Carolinian soldiers. The design Moultrie eventually settled on was a small white crescent in the upper corner by the hoist on a blue field. The blue matched the color of the South Carolinian soldier’s uniforms and the crescent was similar to metal crescents worn on the soldiers’ hats. This flag was first flown at Fort Johnson when Moultrie took command in 1775 and was considered the first American flag to be flown in the south. However, its most famous flying was yet to come. 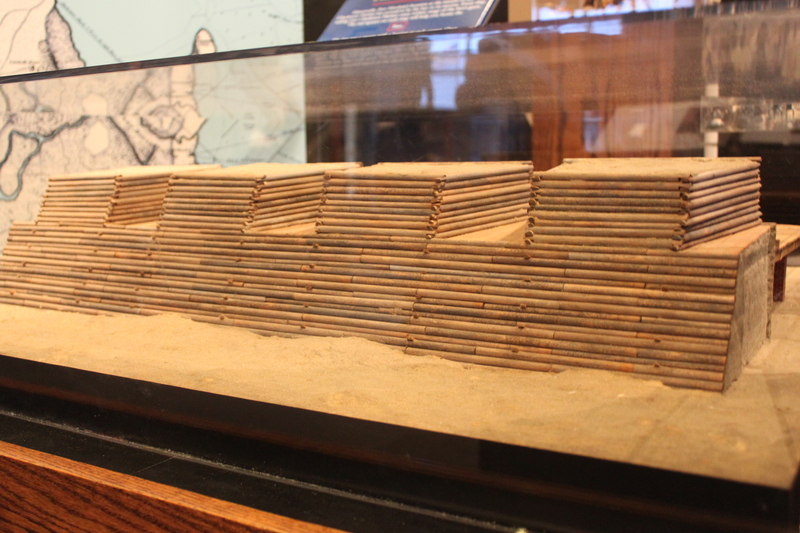 A model of the walls of the fort on Sullivan’s Island. By the end of 1775, Moultrie took command of a new fortification being built on Sullivan’s Island, positioned at the mouth of Charleston Harbor. 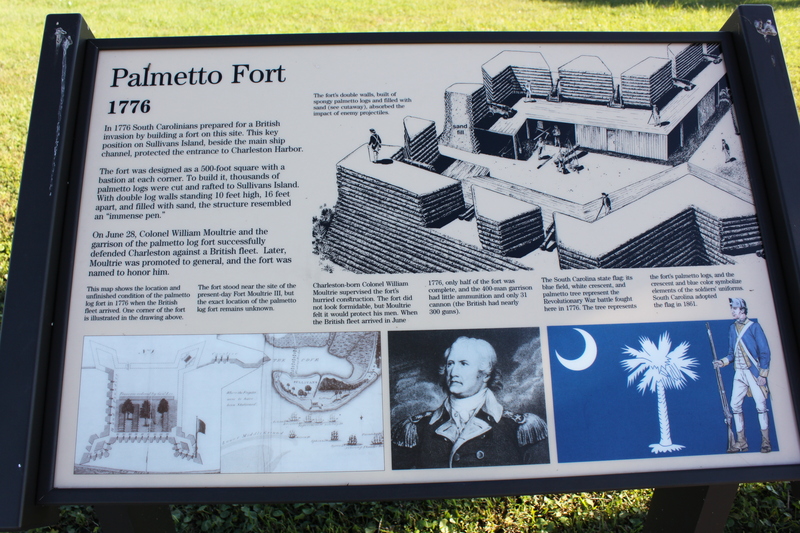 The fort itself was crudely designed, using logs from the area’s abundant palmetto trees to make structures supported by sand mounds. On June 28, 1776, nine British warships attacked the fort in an effort to take Charleston. At this point, construction on the fort was still unfinished and it was only armed with 31 cannon. Despite the British’s superior fire power with more than 300 guns, the spongy palmetto logs absorbed and even deflected much of the canon fire. 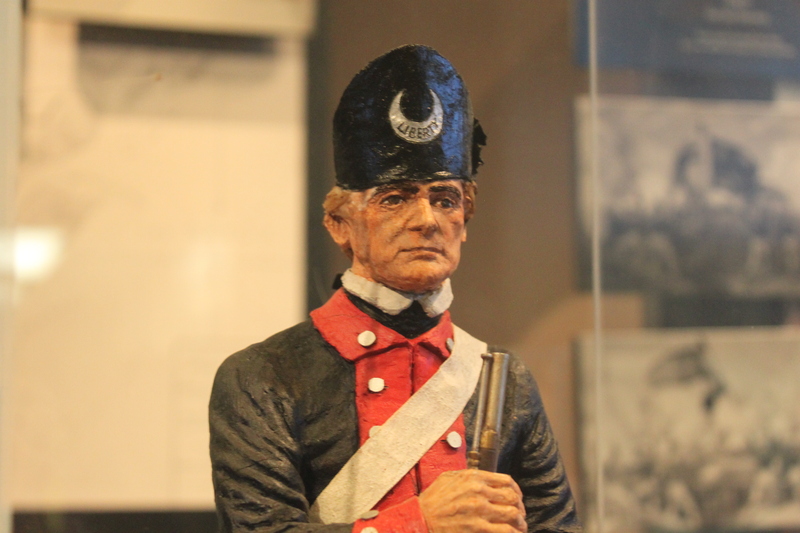 At one point during the battle, Moultrie’s flag was shot down, but Sergeant William Jasper ran out in the open to raise the flag again, renewing the spirit of the 400 men defending the fort. The battle lasted for nine hours, ending with the British retreating after sustaining heavy damages. Before we discuss how Moultrie’s flag evolved into the current South Carolina flag, we should first dive a little deeper into Moultrie’s design. Currently, there are three different designs that are said to be Moultrie’s flag: a crescent on a blue field, the word “liberty” inside a crescent on a blue field, and a crescent on a blue field with the word “liberty” on the bottom third of the field. While each of these designs existed during the war, only one was flown on June 28, 1776. I was fortunate enough to visit the fort recently and the flag their historian claims is the true Moultrie Flag is the plain crescent on the blue field. Model South Carolina soldier with a metal crescent inscribed with “liberty”. Moultrie describe the flag that he designed in his memoirs and nowhere does he mention “Liberty”. However, it was popular for many of the soldiers to inscribe “liberty” or “liberty or death” on the metal crescents that were on their hats. It is thought that flag designs with “liberty” in the crescent became popular shortly after the victory, causing it to be included in many paintings of the battle. The flag with “liberty” across the bottom likely evolved from the liberty crescent flag, either by a mistaken description or as an intentional, in-your-face message to the British. After the battle, the soldiers were hailed as heroes, the fort was renamed in Moultrie’s honor, and his flag became the official banner of the South Carolina militia. 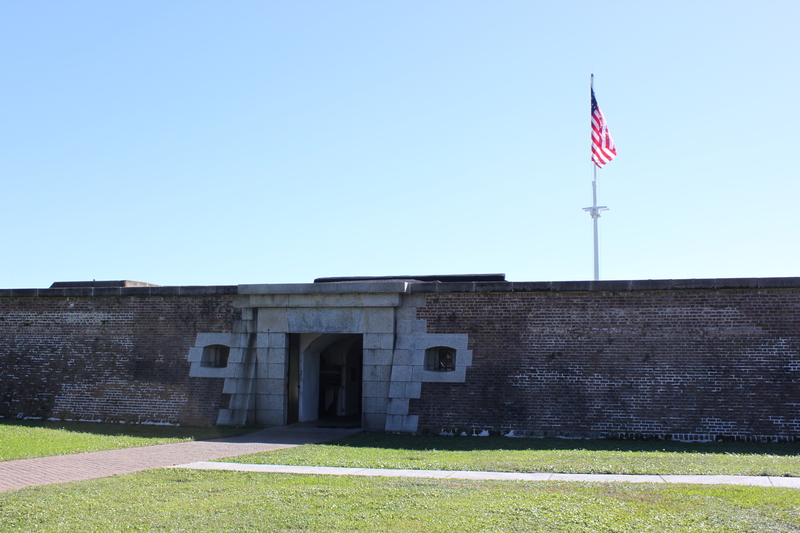 Not to underestimate Fort Moultrie again, the British returned in 1780 with 96 ships and sailed outside of the fort’s gun’s range. Charleston would be under British control until late 1782. Upon the city’s liberation, American General Nathanael Greene presented the city leaders with a Moultrie Flag. The real hero of the June 28 battle, the palmetto tree, would not go unsung either. When South Carolina was succeeding from the Union to become an independent nation (before joining the Confederate State of America), many designs were considered for a national flag. 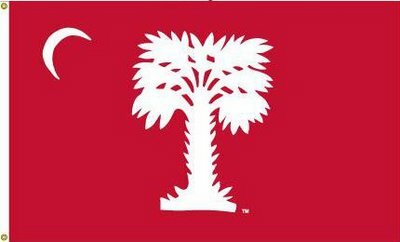 The South Carolina General Assembly ended up choosing a design based on Moultrie’s flag that featured a full-color Golden Palmetto in a while oval, in honor of the tree’s role in the June 28 battle. This design would come to be known as the “Two-Day Flag” as it would be replaced two days later with the simplified, white palmetto of the current South Carolina flag. While states such as Maryland have a code that strictly lays out the design of their flags, South Carolina does not. Because of this, you can find quite a few variations in the design of the palmetto and shape of the crescent depending on their manufacturer. Some notable variations include “Big Red“, the flag of The Citadel, The Military College of South Carolina, the Succession/Sovereignty flag used as an unofficial flag for a brief time during the Civil War, and the “Charleston Strong” flag, proceeds of which support the families of those who were slain in the church shooting. The current Fort Moultrie on Sullivan’s Island, located in the mouth of the Charleston Harbor. As I’ve mentioned in my post about good flag design, states with good flags fly them everywhere and incorporate the flag’s design into just about everything. South Carolina is definitely one of those states. I recently took a trip to Charleston where I found shirts, belts, wallets, glassware, unique art, and much more featuring a palmetto and crescent, all in a store that was flying the South Carolina flag. South Carolinians are very proud of their flag and, in my opinion, it’s for good reason. If you are ever in Charleston, be sure to visit Carolina Flag and Banner. They are a great flag shop with a friendly staff located about 15 minutes from downtown that makes all of their flags in-house. Not only did I buy a Moultrie flag there (the real Moultrie flag), but they were able to make a Germany flag just for me at no extra cost since their stock had been depleted.